Carmen and I had an errand to run in this neighborhood called, according to the Los Angeles Times’ Mapping LA project, “Beverly Grove”. It was the right time to go to “Plancha: A Taco Joint”. The doubly self-referential name of this place is kind of a turn-off. I had read about it on Eater LA when it opened and knew that it was the product of some gringo apparently part of the “Poquito Más” burrito-serving empire; but the good people who write things on Yelp! Seem to like it. Furthermore, they have a crunchy taco called the “Jimmy Taco”, something I wouldn’t mind being called myself. Parking in this DB-filled neighborhood sucked. We walked a couple blocks, passing by Doughboys; several restaurants that look too nice for me to want to go to; then a palpable rotten-fish stench-cloud; then the strife-torn corner at La Jolla and 3rd where opposing dry cleaners Sloan’s and Frederick are locked in eternal battle for cleaner supremacy. We came to Plancha. The customer in front of us in line asked the serveur, “What is al pastor?” That is truly a mystical koan. 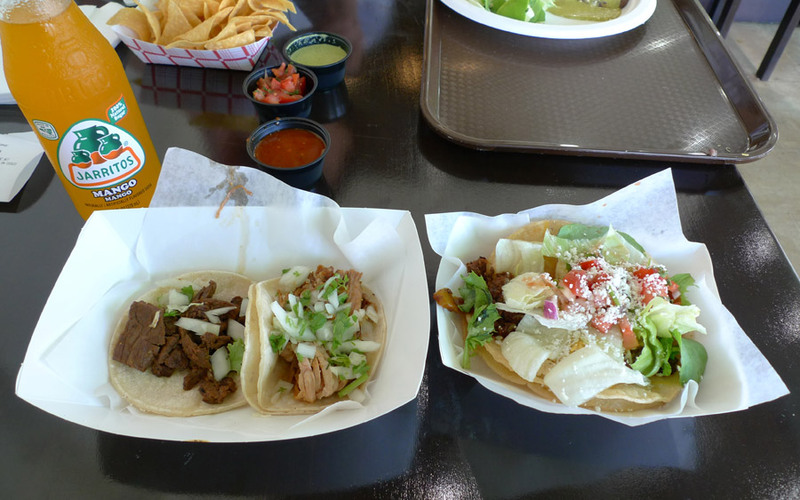 I ordered two “Street Tacos”, one each of steak and al pastor; and one crunchy “Jimmy Taco”. The former were $1.99 each and the later, $2.75. While waiting for our number, I sat down and thought that the Plancha dining area was quite pleasant. A long bar with tall chairs surrounded the kitchen zone, but went unused. We sat at a table in a corner near the front entry. Indirect sunlight through the surrounding glass storefront bathed the space in a cool light. The temperature was cool, just right. The stereo was loud, and the song “Tonight, Tonight, Tonight” by the peerless Phil Collins and Genesis – Phil Collins, the renowned Lord of the Cool, for whom no jacket is ever required. It was nothing but Cool, as I nursed a candy-like Mango Jarritos whilst we waited for our tacos. I thought of the pathosy genius novel American Psycho and then of the atrocious movie version that ruined the novel for me. My tacos were served and I examined them, somewhat perplexed – the steak looked lovely, but the alleged al pastor looked like stringy shredded chicken. The Jimmy Taco didn’t even look like a taco. I started with al pastor. I forked a piece of the shreddy meat into my mouth, confirming that it probably wasn’t accidental chicken but pork after all. Moist, fairly restrained in seasoning but good, it more strongly resembled the grey, shreddy variety of carnitas than anything called al pastor. I generously applied the smoky, pretty good rojo from the salsa bar. I enjoyed it, but categorically, this did not resemble a taco al pastor. The tortillas were bilaminated and sufficient. Next I ate the steak. The chunks were in various sizes – one particularly big chunk stared out at me and gave me a good impression. The lean meat seemed almost too high quality for tacos, and I wished there were more of it – the taco was about average in size. The texture was right on, and the meat had been marinated and tasted lightly of carne asada seasoning salt. The Jimmy Taco came next. After months of diligently, professionally eating soft tacos, I must be having a midlife crisis, as I find myself perversely attracted to things like burritos, quesadillas and crunchy tacos. Not to mention pizzas. The Jimmy Taco looked like a flat tortilla disk covered in a pile of multiple lettuce varieties. According to the description, it featured three cheeses, although only two caught my notice – crumbly white cheese on top and some melty cheese adjacent to the ground beef. The melty cheese offered a pleasing counterpoint to the savory meat and the crunchy, just-fried tortillas. The taco was pretty good, and with so much lettuce, left me with a relatively wholesome feeling for a crunchy taco. 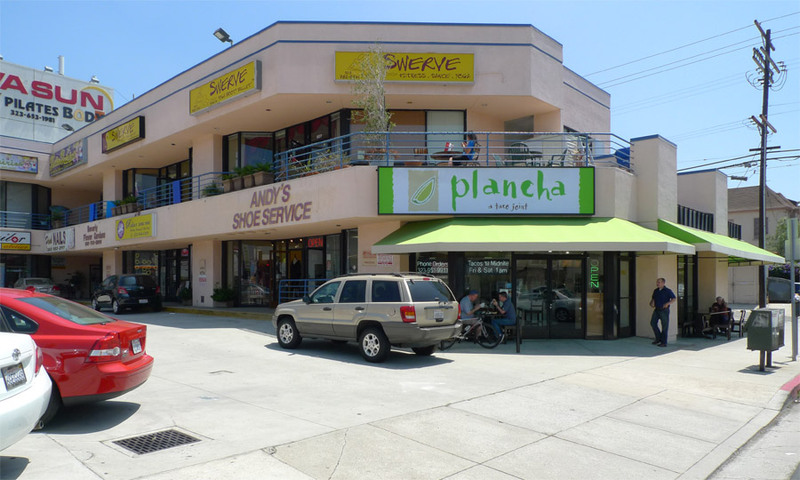 Plancha lived up to its promise – self-referential, inauthentic, high quality taco food – definitely a boon to those fated to spend time in this miserably too-nice neighborhood.